Box Text: Build your army, battle your enemies and become a master of Spinjitzu as you recover powerful ninja weapons and restore the world's harmony in LEGO Battles: Ninjago! Deploy Hero troops through exciting missions and adventures to defeat the sinister Skulkin forces, play as the bad guys and face- off against ninjas of Spinjitzu, or challenge a friend in thrilling multiplayer battles to see whose army ranks supreme. 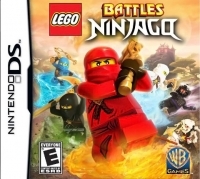 This is a list of VGCollect users who have LEGO Battles: Ninjago in their Collection. This is a list of VGCollect users who have LEGO Battles: Ninjago in their Sell List. This is a list of VGCollect users who have LEGO Battles: Ninjago in their Wish List.